This (female?) was going absolutely nuts around my porch light, which was crawling with bugs tonight, so I'm not sure what, if anything, it was after. 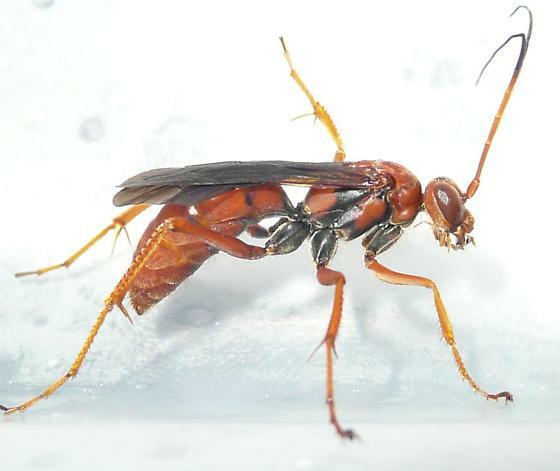 It is a pretty good mimic of Poliste*s red wasps. For the first time, I tried chilling, and it worked great. All shots except for the one in flight were after about 2 minutes in the freezer. was made by Nick after seeing the final image; see his comment there. no problemo. I'll just leave the guide page there for now, just in case. I just looked at Townes. I had a feeling I should have kept my mouth shut until I took a look at Townes. There are six species of Priocnessus and the only one that I have never examined (P. coloradensis) is the one that it could also be. The best way to separate the two is preapical bristles on the underside of the apical tarsal segments: nuperus has them (3-10), coloradensis does not. I read the descriptions of both species and could find no other discreet character to separate the two. Both have been recorded in Texas. I'm afraid we'll have to move this back out to the genus page. looked at every angle again (that showed the legs) to see if I could see anything that looked like bristles but I'm afraid that character is virtually impossible to see without a specimen and a scope. It'll have to remain "Priocnessus nuperus or coloradensis". (Sorry Lynette, I wish I would have gotten to this before you made the guide page). Which legs do you need a better look at? I took many more images, I might have something that shows better what you are looking for. ventral view would be best, but a side view might also do, as long as it is clear. Sometimes this character (which is also used in a genus of much smaller spider wasps, Aporinellus) is difficult to see. If you had a closer side view of a set of tarsi you might be able to crop it in enough to POSSIBLY get an ID. I can't make any guarantees. If you have a bunch of shots you can post them...we might get lucky, and you can always delete or frass them later if there is no value to the guide. a couple of images i have already cropped of legs right now, and later tonight I'll add any other in-focus shots I have showing the legs. Afterwards, feel free to frass any images that aren't useful. You are a moderator and can view the images at full resolution, right? at the leg images. One was acually missing the apical tarsal segments. The other was inconclusive. I thought I saw a slight indication of bristles, but it could have just as easily been an artifact. I think we'll probably just have to leave this one at the genus level just to be safe...sorry. What is the apical tarsal segment? Is it the "foot?" Also, are we talking about a specific leg (front, middle, back), or any leg? One pic had two legs that only had three tarsomeres, there should be five. And as far as I know (what experience has taught me, anyway) is that is refers to any apical tarsal segment (i.e. the ones with the tarsal claw, whichever leg it may be). I have moved it to the genus page until the new guide page for P. nuperus is added. Also, is this a female? This is a pompilid. No, really:-) Subfamily Pepsinae (see teeth on the dorsal surface of the hind tibia and notch in first ventral abdominal segment). The species is Priocnessus nuperus if I am correct. Might want to wait for Nick Fensler to confirm. I believe P. nuperus is also a new species for the guide. Actually, that was the family I was going to guess, but the last time I thought I had a Pomilid I was way off, so I didn't even try here :).